It seems that there is no escaping the woes of today's financial market. Plastered on every copy of the Wall Street Journal and every news segment on CNBC we have all seen pictures of the latest casualties of the financial sector such as Stan O'Neal of Merrill Lynch, Ken Thompson of Wachovia, and Charles Prince of Citigroup and the failure of Indy Mac. Our brains have had to process the latest buzzwords on the street like CDOs (Collaterized Debt Obligation), MBS (Mortgage Backed Securities), and the scourge of today: the Sub-Prime Mortgage crisis. However, not all financial news should be doom and gloom. Just ask the smartest guy in the room, Mike Watanabe, the President and CEO of the Asian-American Drug Abuse Program (AADAP), who successfully executed a plan to save $2 million by using $8 million of tax exempt bonds and new market tax credit subordinated debt. 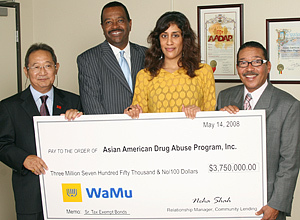 AADAP is a nonprofit corporation that was established in 1972 after an epidemic of Asian youths overdosing shook the Asian community in Los Angeles. AADAP's original mission was to create a comprehensive program to counteract drug abuse problems in the Asian American community. Since then, the organization has grown with the changing needs of its community by broadening its scope of services from drug abuse prevention and treatment to employment development and prevention, HIV/AIDS outreach, counseling, court services and parenting services. AADAP has evolved into a comprehensive service provider that offers residential and outpatient programs through its various units and its Prevention Unit combats drug abuse in a variety of communities and languages. The outpatient unit has been a major contributor to the organizations growth during the past 8 years. The organization has serviced at least 50,000 clients over the last five years. In order to continue their vital work, AADAP wanted to acquire a 25,000 square foot building for its administrative offices. The new building, located at 2900 Crenshaw Boulevard, would cost $5,000,000 and is located right in the heart of the area that AADAP has served for more than 30 years. Watanabe engaged the services of the Los Angeles LDC, Inc. (LDC), a leading community development financial institution (CDFI) that specializes in working with non-profit organizations and uses its capital to provide innovative financial solutions, including tax-exempt bond financing. Michael Banner, President and CEO of the LDC, has been AADAP's lender since 2000. They have funded the acquisition of several buildings to support the organization's growing operations. Furthermore, he explained that by using tax-exempt bonds instead of commercial real estate loans, AADAP would be able to reduce their interest cost and monthly payments. The LDC funded the acquisition with a $4,375,000 bridge loan and began to execute a financing strategy that involved $8,000,000 of financing with three (3) office buildings, three (3) lenders and two (2) different bond authorities. "It takes a special community development lender to accomplish this type of complex financing and the LDC's expertise was a key factor in reaching our goal of acquiring a new administrative office with maximum leverage and the lowest possible borrowing cost", said Kenneth Kasamatsu, AADAP's Treasurer and President of Branch Banking at Pacific Commerce Bank. Tax-Exempt bonds or certificates of participations (COP) are issued by a municipal, county or state government agency for qualified projects sponsored by private businesses and non-profit 501(c) (3) entities. These private activity bonds carry a tax-exempt status which results in lower interest rates paid to bondholders which often produces a 20%-30% in interest rate savings for borrowers. The repayment of the bonds to investors is limited to project revenues and sponsors creditworthiness. Bonds are not guaranteed by the issuer (public government agency). Borrower must be creditworthy and must meet the underwriting standards of a private placement buyer or credit enhancement provider such as WaMu and Comerica Bank. The use of private activity bonds allowed AADAP to realize a reduction in interest cost which can be redirected for other purposes such as program cost or to fund operations. With the $8,000,000 conversion to tax-exempt bonds, utilizing combination of both fixed rate privately placed COPs and letter of credit backed variable rate demand notes, AADAP is able to project a $2 million savings over a ten year period (not including the cost of issuance of the bonds). They also reduced the organization's annual debt service by $290,000 and significantly lowered their equity requirement after the LDC's arranged subordinated new markets tax credit debt of $625,000. Mr. Watanabe could not be more pleased with the results of this transaction, saying that his experience with this transaction and with the LDC has been "great" and he "would recommend tax-exempt financing" to any qualified non-profit organization. Watanabe concluded by saying, "by working with the LDC, you get access to smart money - not only do you get the best financing solution available, but you even learn a lot along the way".